House and Senate negotiators agreed on spending on education, state salaries and benefits this morning and hope to have the final vote on the 2012-13 budget sometime this weekend. The budget conference committee, made up of five House members and five Senate members, met to resolve their differences on the two remaining sections of the budget. They reconciled other differences between the House and Senate versions a week ago. After it's all printed, they are scheduled to vote on a final report on Thursday that can be sent to both chambers. All it takes is a simple majority vote in each house to pass the budget bill and send it to the governor's desk. Legislative Budget Board staff listed off dozens of state agencies and programs in K-12 and higher education, followed by whether the committee would follow the House or the Senate recommendations. You can see the draft report for each section of the budget here. Anecdotally, it appeared the differences were split between both chambers. For example, student financial aid funding will be closer to the Senate's version, which proposed helping more current and new college students than the House version. Lawmakers kept the meeting cordial. 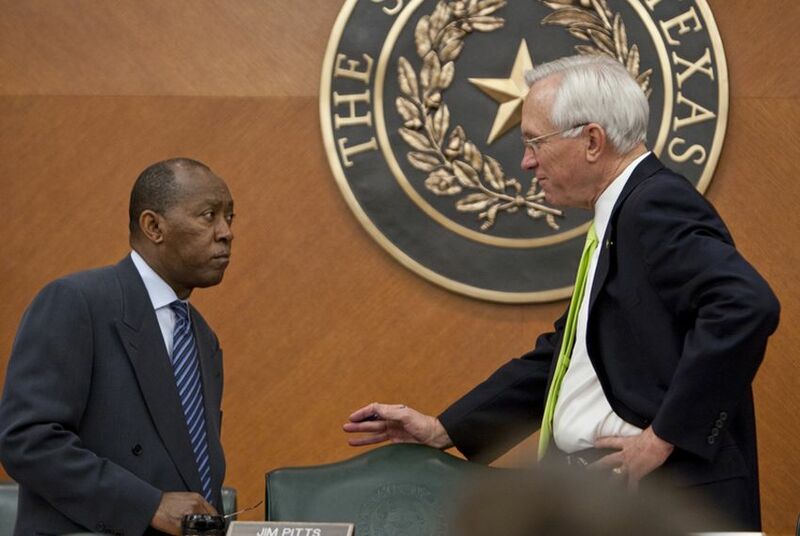 At one point during the short debate, before passage of the article pertaining to state salaries and benefits, state Rep. Sylvester Turner, D-Houston, expressed some discontent. "We’re asking people to do more for less across the board," he said. Senate Finance Chairman Steve Ogden, R-Bryan, and House Appropriations Chairman Jim Pitts, R-Waxahachie, raced out of the room before the media could ask them questions. They have much to do in addition to getting the conference committee's recommendations through their respective chambers before the session's May 30 deadline; the budget itself is only one of several bills that have to pass to keep the state's financial business in order.